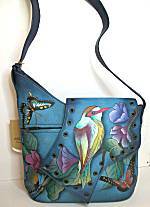 This page features crossbody style bags from the various designers offered at The Artful Soul. A crossbody bag features extra long strap that lets the bag be worn across the body, often ideal for travel and walking and big-city life. However, many of these offer optional shorter strap options, check the item description carefully! Folded as shown, this is about 6 inches square, it stays closed with a velcro patch. When opened it has a full zipper pocket, passport size slot, and small slot for other little papers. On the outside is another slash zipper pocket. Long ultrasuede strap adjusts in length and has lobster toggle on one side, so you can wear this around the waist, cross body, over the shoulder, under you clothes when traveling. The Blueberry fabric is organic squares and circles of woven and low-cut chenille, dark/medium blues and tan. Folded as shown, this is about 6 inches square, it stays closed with a velcro patch. When opened it has a full zipper pocket, passport size slot, and small slot for other little papers. On the outside is another slash zipper pocket. Long ultrasuede strap adjusts in length and has lobster toggle on one side, so you can wear this around the waist, cross body, over the shoulder, under you clothes when traveling. The Elderberry fabric is woven in muted shades of lavender, rose, peach and blue with dark blue/gray outlines defining the oval pattern. You get one bag with 2 colors, as the flap can be flipped from front to back. We show it with the pattern fabric on the outside, but flip the flap, and it is solid black on the outside (an ultrasuede texture). Measures 7 x 7 x 2 inches. Open pocket on one side, a zipper pocket on the other, unlined interior. The strap adjusts 15-30 inches, and has lobster toggle on one side so you can even wear this around your waist! The Bluetooth fabric is woven with some low-cut chenille, dark blue threads mixed with navy, medium and light blues, celery and tourmaline greens. 8 x 6 x 1-3/8 inches, this yummy soft all-leather bag features long leather wrapped cord to wear cross-body for walking, and you could easily tie shorter for shoulder-wearing if preferred. Zip top in same color. Minimal chrome hardware on zipper pull and holes for shoulder cord. All done in turquoise (more green than blue) dyed leather. On the front is open pocket, on the back is same color zipper on lined pocket. Zip top. Interior lined in turquoise fabric, with small zip pocket trimmed in turquoise leather. 8 x 6 x 1-3/8 inches, this yummy soft all-leather bag features long leather wrapped cord to wear cross-body for walking, and you could easily tie shorter for shoulder-wearing if preferred. Zip top in same color. All done in saddle tan dyed leather. On the front is open pocket trimmed with chrome studs and wonderful fringe. On the back is same color zipper on lined pocket. Zip top. Interior lined in brown fabric, with small zip pocket trimmed in saddle leather. All done in purple orchid dyed leather. On the front is open pocket trimmed with chrome studs and wonderful fringe. On the back is same color zipper on lined pocket. Zip top. Interior lined in purple fabric, with small zip pocket trimmed in purple leather. 7 x 8-1/2 x 1-1/2 inches, this yummy soft all-leather bag features long leather wrapped cord to wear cross-body for walking, and you could easily tie shorter for shoulder-wearing if preferred. Zip top in same color. Minimal chrome hardware on zipper pull and holes for shoulder cord. All done in warm toffee brown dyed leather. On the front is open pocket, on the back is same color zipper on lined pocket. Zip top. Interior lined in brown fabric, with small zip pocket trimmed in toffee leather. All done in jeans blue dyed leather. On the front is open pocket, on the back is same color zipper on lined pocket. Zip top. Interior lined in brown fabric, with small zip pocket trimmed in jeans blue leather. All done in pewter gray dyed leather. On the front is open pocket, on the back is same color zipper on lined pocket. Zip top. Interior lined in gray fabric, with small zip pocket trimmed in gray leather. 7 x 8-1/2 x 1-1/2 inches, this yummy soft all-leather bag features long leather wrapped cord to wear cross-body for walking, and you could easily tie shorter for shoulder-wearing if preferred. Zip top in same color. All done in turquoise (more green than blue) dyed leather. On the front is open pocket trimmed with chrome studs and wonderful fringe. On the back is same color zipper on lined pocket. Zip top. Interior lined in turquoise fabric, with small zip pocket trimmed in turquoise leather. All done in saddle tan dyed leather. On the front is open pocket trimmed with chrome studs and wonderful fringe. On the back is same color zipper on lined pocket. Zip top. Interior lined in brown fabric, with small zip pocket trimmed in saddle tan leather. All done in jeans blue dyed leather. On the front is open pocket trimmed with chrome studs and wonderful fringe. On the back is same color zipper on lined pocket. Zip top. Interior lined in brown fabric, with small zip pocket trimmed in jeans blue leather. All done in dark brown dyed leather. On the front is open pocket trimmed with chrome studs and wonderful fringe. On the back is same color zipper on lined pocket. Zip top. 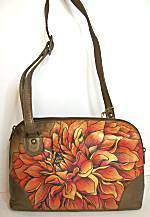 Interior lined in orange fabric, with small zip pocket trimmed in dark brown leather. Yummy soft pebble texture leather dyed tan brown, like dark caramel. Bag measures 7 x 9 x 1 inch, has 50 inch long leather strap for cross-body wearing, it's made for walking! On the back is a zipper pocket. On the front is flap closing with single snap. Inside is lined in taupe fabric with small zip pocket and open space. Yummy soft pebble texture leather is dyed berry red color, somewhere between brick and raspberry. Bag measures 6-1/2 x 7 x 1-3/4 inches, comes on slender leather shoulder strap that adjusts with goldplated buckle to any length, even cross-body. On the back is an open pocket for maps and such. The front flap has an outside zipper pocket. The flap closes with 2 bottom snaps. 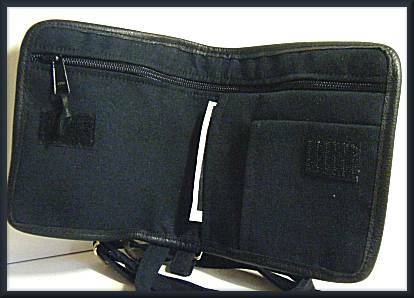 Opens to tan-lined interior area, on the outside of which are 8 card slots and cellphone/glasses pocket. This is a great travel bag!